The first batch of snow will exit the area by 11PM to midnight. (last over areas near New Hampshire). Around 5AM the backlash of the snow will move through the area with moderate to perhaps heavy snow for a few hours in the morning. Winds will increase during this time. I expect 3 to 7 inches of new snow in the morning before it ends between 11AM and 1PM. Temperatures will also start to fall. You should try to clear the snow as soon as it stops as wind and cold will become a big issue for the rest of the day. 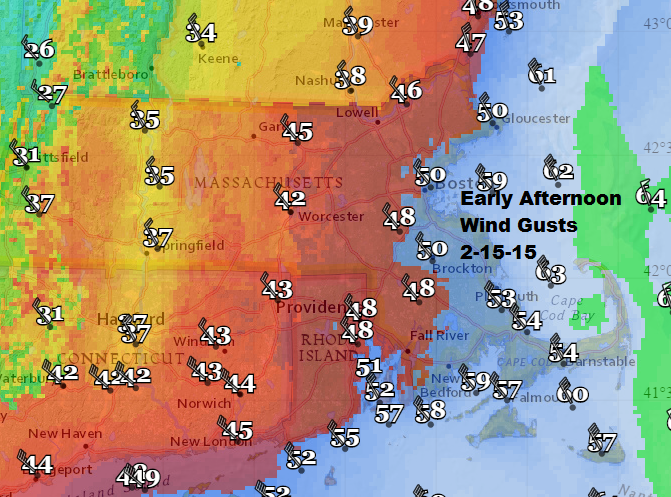 The strongest wind will be along the coastline. 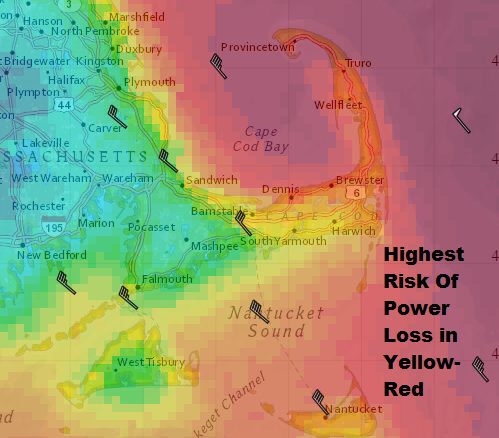 I don’t expect power outages to be widespread, but there could be scattered ones along the coast. Many areas may not reach blizzard criteria, although blizzard conditions could occur for a period of time in some areas. The image below courtesy of WeatherBell Analystics is the projected radar at 10AM Sunday. Moderate to at times briefly heavy snow continues to fall across the area. For most of you the bulk of the snowfall from this storm will come in this first wave. The is going to be a break in the snowfall after 10PM and this will continue for much of the night. The snow may not completely stop, but it will be much lighter. The next round of snow moves in early Sunday with an arctic front. This will also be the beginning of the colder air and the wind. I’ll have updates throughout the morning tomorrow here and on my Twitter feed @growingwisdom. Snow is falling lightly in many areas. This will continue through the evening with some heavier bursts during this time. 2-4 inches on the ground by about 10PM. Model trends continue to keep heaviest precipitation off the coast during this upcoming storm. Remember, you can still have a blizzard without a lot of snow. My snow map reflects current thinking based on all the trends and data I am seeing this afternoon. The bottom line, we aren’t going to see as much snow as was forecast. There are going to be two accumulating snow periods with this system. The first is now through the evening and then again tomorrow morning after a lull. This evening the snow could come down quite hard for a few hours, without much wind. Did you look at your thermometer this morning? Many areas were well below zero with 5, 8 and even 13 below readings appearing. The National Weather Service in Taunton tied its coldest morning since they moved to that office back in 1996 at 9 below zero. This storm will have three main components: strong winds, cold and snow. 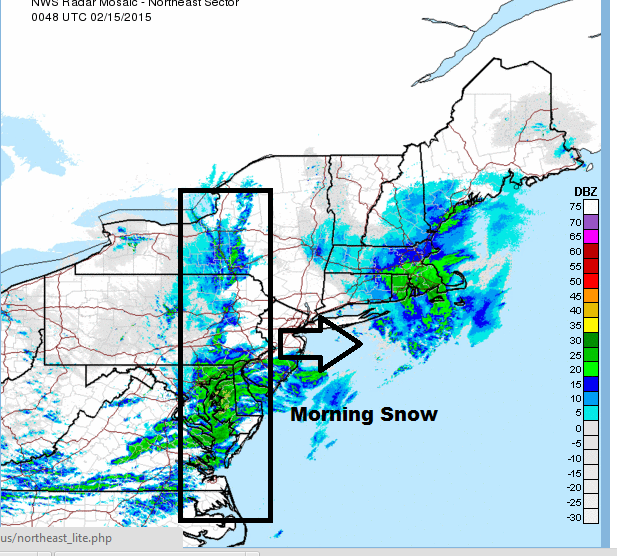 Snow continues to overspread the region this afternoon. Since roads are so cold, the snow will quickly accumulate, but the wind won’t be a factor and travel will just be slowed. It’s Valentine’s Day and you might have dinner plans at a restaurant. The very short range models are showing snow and perhaps some bursts of moderate snow between 5PM and 8PM. I expect 2 to 4 inches on the ground by 9 or 10PM, about the time a lull develops. If you aren’t driving very far, why not keep the plans? Don’t forget to call the restaurant to cancel if stay home. This is a big night for many restaurants and if you can safely go, it’s a great way to support local business. The Sunday potential blizzard will be caused by a piece of energy that drops to the coastline and then quickly becomes very intense. Meteorologists call this rapid intensification “bombogenensis”. The evening snow is from the initial piece of energy moving through the region. M predicted lull in the snow will occur as the storm starts to reform. At this time, the snow may stop completely or just become very light. This should last through the night into sunrise in some areas before the snow resumes. The storm will intensifying in the morning, but then wind down during the afternoon. If blizzard conditions are going to occur, the morning is when it will be happen. Snow bands rotating around the storm will be heaviest south of Boston. 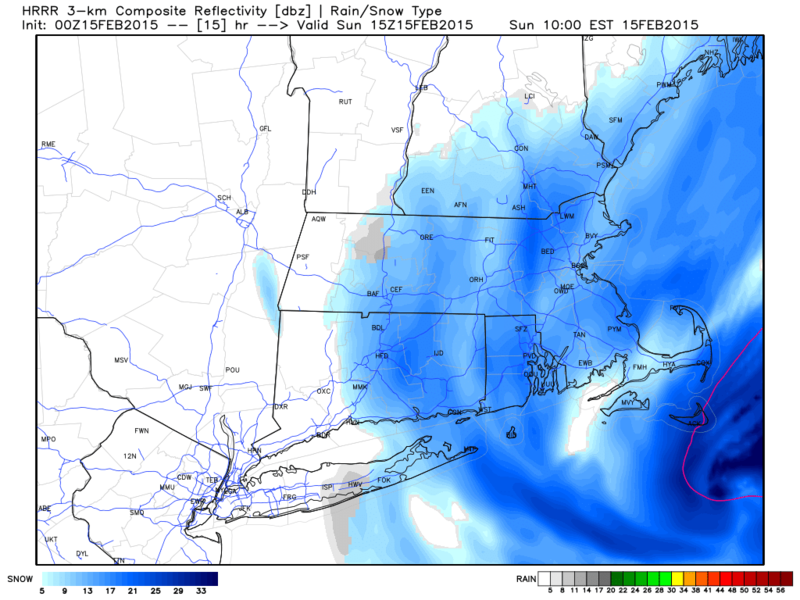 It appears Cape Cod, and the South Shore will be most vulnerable to bands of heavy snow. Parts of Essex County can also see some heavier snow. The wind will whip the snow into drifts and blow it off the ground. A blizzard occurs when winds reach 35 miles per hour or more, for three hours in a row and these winds combine with falling snow or snow off the ground to lower visibility to a quarter mile or less. The snow will end completely during the afternoon. The warnings will likely be refined as conditions change Sunday. Temperatures will recover back into the 20s today from the cold morning. Overnight it will still be in the teens, so not bitter cold. When you get up tomorrow temperatures will range from 15-20F, but during the day, as the winds turn and come from the northwest, temperatures will fall into the single numbers. At this time wind chills will fall to the teens below zero. 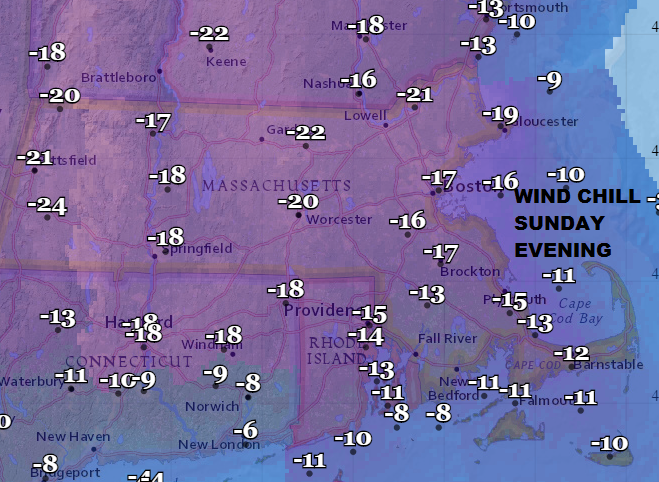 Wind chill Sunday night will range from 20-30 below zero, dangerous levels. As I expected, the models continue to back off on snowfall totals. The focus of any banding looks to be moving further south. This means the South Shore and perhaps Cape Cod will end up with the most snow. 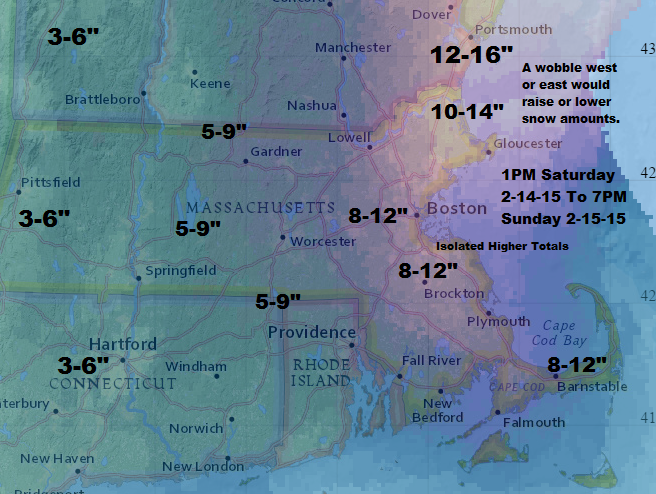 Boston will be in the 6-10 inch range including what falls tonight. This is a very dynamic storm and to be honest, this could change again tomorrow morning, if the storm wobbles even 40 miles further west or east. The cold air will keep the snow light and fluffy. The snow will blow off many higher roof tops, but create drifts on the roofs that are lower. You’ll need to assess for yourself if snow removal makes sense after the storm. If you don’t have issues with ice dams and it’s not too deep, you can leave the snow up there, it does act as a good insulator. The storm will bring the chance of minor to perhaps moderate coastal flooding. The greatest risk will be from Salisbury to Cape Ann and this includes Plum Island. Beach erosion is going to be an issue for Cape Cod Bay and from Dennis to Sandwich. High tide occurs around 7:30AM Sunday. It’s not an astronomically high tide. Since the storm is moving quickly the Sunday evening high tide should be less problematic. Winds will be strong enough to blow down some tree limbs etc. along the coast and this can always causes a loss of power. The snow will be light so the weight of it won’t be an issue on power lines. During the blizzard in January, many of us kept power, but winds may be a bit stronger this time. 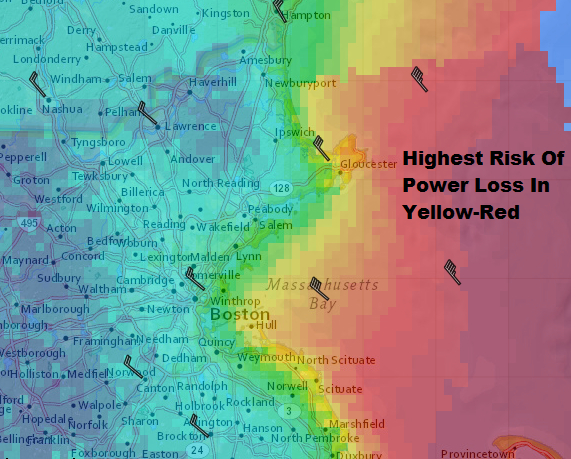 The can lead to more widespread power issues, especially along the coastline. Because it’s so cold, I would have a plan in place to execute if you do lose power. If the power were out for a day or longer freezing pipes can become an issue. The strong winds will create big issues on the runways Sunday. If winds reach 50 miles per hour, flights are halted regardless of the snow. I think Sunday is a non-starter for most planes. Monday will be a day when the airlines are trying to get all the equipment back in place. There is the chance for more snow during the middle of next week. This storm will be moving up from the Gulf Coast and therefore has a lot of moisture potential. This obviously has big consequences if did see another major storm, especially if it’s wetter snow.